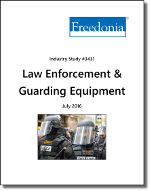 Sales of law enforcement and guarding equipment in the US are projected to increase 3.5 percent annually through 2020 to $1.2 billion. Overall demand growth will be driven by the rising number of guards and law enforcement officers. Relatively rapid growth in the number of armed guards will contribute to a rising amount of equipment sales per officer, as armed guards typically utilize more and higher value products. Demand will further benefit from the rising adoption of expensive, high technology products such as license plate readers, stationary cameras, body cameras, conducted electrical weapons, and drones. Sales of license plate readers and stationary cameras will particularly benefit from both the growing number of agencies that utilize these products and the decision of many agencies that already utilize these products to expand their existing stock. Newer technologies, especially body cameras and drones, are expected to see strong increases in the number of units sold, though value demand will be limited to a degree by declining prices as manufacturers attempt to offer more cost-efficient products for budget-conscious agencies. The ongoing implementation of related state and local regulations will have a varied effect on demand for many of these products, as they may either help or hinder their adoption. Companies mentioned include Safariland, TASER International, and L-3 Communications.